Alabama became the 22nd U.S. state on December 14, 1819. On January 11, 1861, however, Alabama declared its secession from the Union and joined the Confederacy. While few battles were fought in the state, Alabama contributed approximately 120,000 soldiers to the American Civil War (1861-1865). It provided a significant source of troops and leaders, military material, supplies, and food. Early in the war, cotton was exchanged in England for munitions until the port of Mobile was closed by the U.S. Navy in 1864. Alabama's slaves were freed by the 13th Amendment in 1865. Alabama is a state located in the southeastern region of the United States. It is bordered by Tennessee to the north, Georgia to the east, Florida and the Gulf of Mexico to the south, and Mississippi to the west. Alabama is unofficially nicknamed the Yellowhammer State, after the state bird. Alabama is also known as the "Heart of Dixie." The state tree is the Longleaf Pine and the state flower is the Camellia. The capital of Alabama is Montgomery. The oldest city is Mobile, founded by French colonists. Indigenous peoples of varying cultures lived in the area for thousands of years before European colonization. Among the historical tribes of Native American people living in the area of present-day Alabama at the time of European contact were Iroquoian-speaking Cherokee, and the Muskogean-speaking Alabama (Alibamu), Chickasaw, Choctaw, Creek, and Koasati. The French founded the first European settlement in the region at Old Mobile, in 1702. The city was moved to the current site of Mobile in 1711. This area was French from 1702 to 1763, part of British West Florida from 1763 to 1783, and split between the United States and Spain from 1783–1821. Thomas Bassett, a loyalist to the British monarchy, was the one of the earliest white settlers in the state outside of the Mobile area. He settled in the Tombigbee settlements, in what is now Washington County, during the early 1770s. What is now the counties of Baldwin and Mobile became part of Spanish West Florida in 1783, part of the independent Republic of West Florida in 1810, and was finally added to the Mississippi Territory in 1812. Map showing the formation of the Mississippi and Alabama territories. The area composing today's northern and central Alabama and Mississippi, then known as the Yazoo lands, had been claimed by the Province of Georgia after 1767. Following the Revolutionary War, it remained a part of Georgia, although heavily disputed. With the exception of the immediate area around Mobile and the Yazoo lands, what is now central Alabama was made part of the Mississippi Territory upon its creation in 1798. The Yazoo lands were added to the territory in 1804, following the Yazoo land scandal. Spain had kept a governmental presence in Mobile after 1812. When Andrew Jackson's forces occupied Mobile in 1814 he demonstrated the United States' de facto authority over the region, which effectively ended Spanish influence, although not its claim, while gaining an unencumbered passage to the Gulf of Mexico from the hinterlands of the territory. Prior to the admission of Mississippi as a state on December 10, 1817, the more sparsely settled eastern half of the territory was separated and named the Alabama Territory. 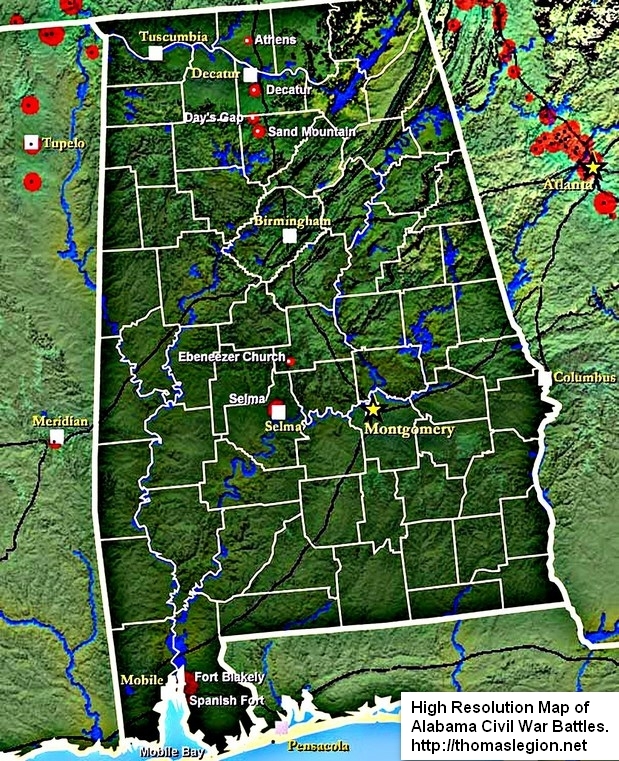 The Alabama Territory was created by the United States Congress on March 3, 1817. St. Stephens, now a ghost town, served as the territorial capital from 1817 to 1819. 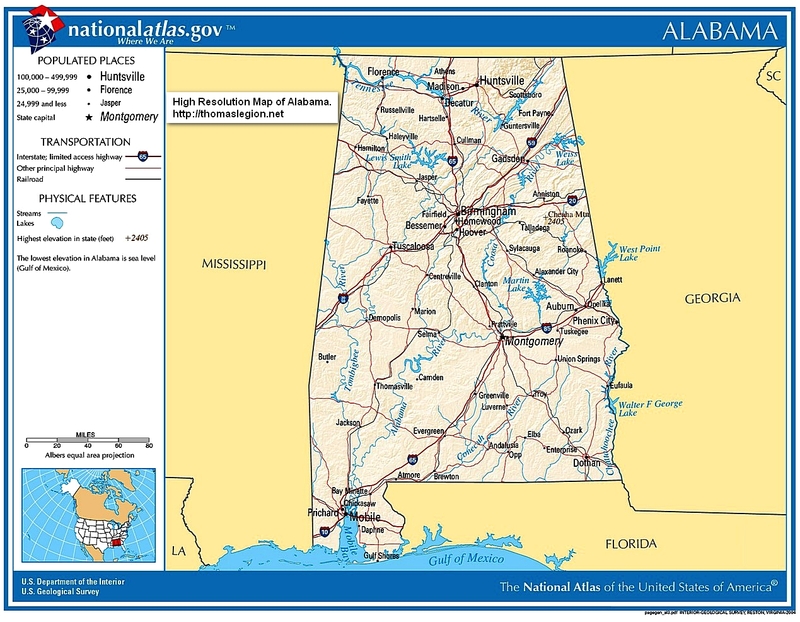 Alabama was admitted to the Union in 1819 as the 22nd state. Cahaba was the first permanent state capital, from 1820 to 1825. Alabama Fever was already underway when the state was admitted to the Union, with settlers and land speculators pouring into the state to take advantage of fertile land suitable for cotton cultivation. Southeastern planters and traders from the Upper South brought slaves with them as the cotton plantations in Alabama expanded. The economy of the central Black Belt (named for its dark, productive soil) was built around large cotton plantations whose owners' wealth grew largely from slave labor. The area also drew many poor, disfranchised people who became subsistence farmers. Alabama had a population estimated at fewer than 10,000 people in 1810, but it had increased to more than 300,000 people by 1830. Most Native American tribes were completely removed from the state within a few years of the passage of the Indian Removal Act by the United States Congress in 1830. Following the War of 1812 and the defeat and expulsion of the Creek Nation, European-American settlement in Alabama was intensified, as was the presence of slavery on newly-established plantations in the territory. Like its neighbors, the Alabama Territory was fertile ground for the surging cotton crop, and soon became one of the major destinations for African-American slaves who were being shipped to the extreme Southeastern United States. 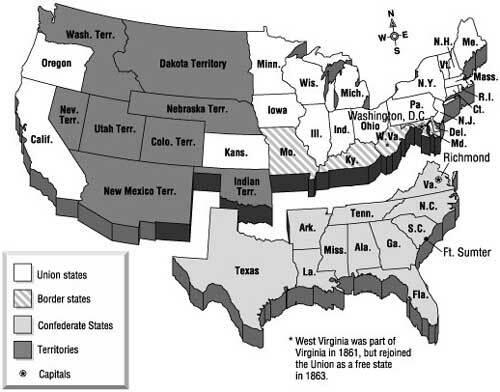 Most of the settlers came from the nearby states of North Carolina, South Carolina and Georgia, attracted by the prospect of fertile planting of cotton in the Tennessee Valley and Black Belt. The plantation system was solidified throughout the first half of the 19th century, and Alabama was one of the first seven states to withdraw from the Union prior to the American Civil War. However, by the eve of the Civil War, only a minute portion of the population continued to own slaves, as the state had experienced a slave-labor decline. The "Unionists" were successful in the elections of 1851 and 1852. Passage of the Kansas-Nebraska Bill and uncertainty about agitation against slavery led the State Democratic convention of 1856 to revive the "Alabama Platform". When the Democratic National Convention at Charleston, South Carolina, failed to approve the "Alabama Platform" in 1860, the Alabama delegates, followed by those of the other "cotton states", withdrew. Upon the election of Abraham Lincoln, Governor Andrew B. Moore, as previously instructed by the legislature, called a state convention. Many prominent men had opposed secession. In North Alabama, there was an attempt to organize a neutral state to be named Nickajack. With President Lincoln's call to arms in April 1861, most opposition to secession ended. On January 11, 1861, the State of Alabama adopted the ordinances of secession from the Union (by a vote of 61-39). Until February 18, 1861, Alabama was informally called the Alabama Republic. It never changed its formal name which always has been "State of Alabama". Alabama joined the Confederate States of America, whose government was organized at Montgomery, on February 4, 1861. According to the 1860 U.S. census, Alabama had a free population of 529,121 and an additional slave population of 435,080. Alabama was not the scene of many major military operations and actions, yet the state contributed approximately 120,000 men to the Confederate service, which was practically all the state's white population capable of bearing arms. Most were recruited locally and served with men they knew, which strengthened esprit de corps. A compilation made from the official rosters of the Confederate Armies as they stood at various battles, and at various dates covering the entire period of the war, shows that Alabama kept the following number of organizations in almost continuous service in the field: 55 regiments of infantry, and 11 battalions of infantry; 5 regiments of cavalry; 3 regiments of partisan rangers; and 16 batteries of light artillery. Whereas a total of 2,576 Alabama men served in the Union Army, according to statisticians Phisterer (1883), Fox (1889) and Dyer (1908), it resulted in a total of 345 deaths from all causes during the course of the four year conflict (1861-1865). Alabama was the battlefield for the following principal battles: Battle of Athens, Battle of Day's Gap, Battle of Decatur, Battle of Fort Blakely, Battle of Mobile Bay, Battle of Newton, Battle of Selma, and Battle of Spanish Fort. Alabama soldiers fought in hundreds of battles throughout numerous states. The state's losses at Gettysburg were 1,750 dead plus captured or wounded; the famed "Alabama Brigade" suffered 781 casualties. (See also 15th Alabama Infantry Regiment: HOMEPAGE.) Nealy 120,000 Alabamians served in the Confederate forces, and approximately 35,000 died and another 30,000 were seriously wounded. Medical conditions were severe; about 15% died of disease, and 10% from battle. Alabama had few well-equipped hospitals, but it had many women who volunteered to nurse the sick and wounded. Soldiers were poorly equipped, especially after 1863, and often resorted to pillaging the dead for boots, belts, canteens, blankets, hats, shirts and pants. Uncounted thousands of slaves worked with Confederate troops; they took care of horses and equipment, cooked and did laundry, hauled supplies, and helped in field hospitals. Other slaves built defensive installations, especially those around Mobile. They graded roads, repaired railroads, drove supply wagons, and labored in iron mines, iron foundries and even in the munitions factories. The service of slaves was involuntary, their unpaid labor was impressed from their unpaid masters. About 10,000 slaves escaped and joined the Union army, along with some 2,500 white men who had remained loyal to the Federal government. Antebellum Governor Andrew B. Moore energetically supported the Confederate war effort. Even before hostilities began in April 1861, he seized Federal facilities, sent agents to buy rifles in the Northeast, and scoured the state for weapons. Despite some resistance in the northern part of the state, Alabama joined the Confederate States of America. Congressman Williamson R. W. Cobb, a Unionist, pleaded for compromise. He ran for the First Confederate Congress, but was soundly defeated (he was subsequently elected in 1863 on a wave of anti-war sentiment, with war weariness growing in Alabama). The new nation brushed Cobb aside and set up its temporary capital in Montgomery and selected Jefferson Davis as president. In May, after Virginia seceded, the Confederate government abandoned Montgomery and relocated its capital to Richmond, VA. Some of the severe internal logistics problems the Confederacy faced can be seen by tracing Jefferson Davis's journey from Mississippi, an adjoining state. From his plantation on the river, he took a steamboat down the Mississippi to Vicksburg, boarded a train to Jackson, where he took another train north to Grand Junction, then a third train east to Chattanooga, Tennessee, and a fourth train to Atlanta, Georgia. Yet another train took Davis to the Alabama border, where a final train took him to Montgomery. As the war proceeded the Federals seized the Mississippi River, burned trestles and railroad bridges, and tore up track; the frail Confederate railroad system faltered and virtually collapsed for want of repairs and replacement parts. Thirty-nine Alabamians attained the rank of general or admiral, most notably Lieutenant General James Longstreet and Admiral Raphael Semmes. Josiah Gorgas, who came to Alabama from Pennsylvania, was the Chief of Ordnance for the Confederacy. He located new munitions plants in Selma that employed 10,000 workers until Federal raiders in 1865 burned down the factories. The Selma Arsenal made most of the Confederacy's ammunition. The Selma Naval Ordnance Works manufactured artillery, turning out a cannon every five days. The Confederate Naval Yard built ships and was noted for launching the CSS Tennessee in 1863 to defend Mobile Bay. Selma's Confederate Nitre Works procured niter for gunpowder from limestone caves. When supplies were low, it advertised for housewives to save the contents of their chamber pots—urine was a rich source of organic nitrogen. In 1863, Union Col. Abel Streight led a raid through northern Alabama with hopes of recruiting unionists and disrupting Confederate supply lines to the Army of Tennessee. The raid was a failure for the Union forces, and Confederate Gen. Nathan Bedford Forrest gained national attention when he captured Streight and his men despite being outnumbered. A company of cavalry soldiers from Huntsville, Alabama, joined Gen. Forrest's troops in Kentucky. The Huntsville company wore fine, new uniforms with yellow cloth on the sleeves, collars and coat tails. This led to them being greeted with "Yellowhammer" and later all Alabama troops in the Confederate Army were nicknamed "Yellowhammers". In 1863 the state's losses at the Battle of Gettysburg were 1,750 dead plus captured or wounded—the famed "Alabama Brigade" sustained 781 casualties. In 1863, Federal forces also secured a foothold in northern Alabama in spite of spirited opposition from Confederate cavalry under General Nathan B. Forrest. In 1864 and 1865, Alabama, however, witnessed defeats in a series of strategic and tactical battles from Mobile Bay to Spanish Fort to Selma to Fort Blakely. In 1861 the Union blockade had closed Mobile Bay, and in 1864 the outer defenses of Mobile were taken by a Federal fleet during the Battle of Mobile Bay. On April 12, 1865, three days after the surrender of Robert E. Lee at Appomattox Courthouse, the city of Mobile surrendered to the Union army to avoid destruction following the Union victories at the Battle of Spanish Fort and the Battle of Fort Blakely. The Magee Farm, north of Mobile, was the site of preliminary arrangements for the surrender of the last Confederate States Army east of the Mississippi River. Confederate General Richard Taylor, son of former President Zachary Taylor, negotiated a ceasefire with Union General Edward Canby at the house on April 29, 1865. Taylor's forces, comprising 47,000 Confederate troops serving in Alabama, Mississippi and Louisiana, were the last remaining Confederate force east of the Mississippi River. It is estimated that 20,000 veterans returned home permanently disabled, and there were 20,000 widows and 60,000 orphans. With cotton prices low, the value of farms shrank. The livestock supply shrank too, as the number of horses declined from 127,000 to 80,000, and mules 111,000 to 76.000. The overall population remained the same--the growth that might have been expected was neutralized by death and emigration. Cahaba Prison, also known as Castle Morgan or Cahaba Prisoner-of-War Camp, was a prisoner-of-war camp near Selma, Alabama, where the Confederacy held captive Union soldiers during the Civil War. The prison was located in the small Alabama town of Cahaba, at the confluence of the Alabama and Cahaba Rivers, not far from Selma. The Cahaba Prison was opened in June 1863. The commanding officer was Captain H. A. M. Henderson, a Methodist minister. The prison structure, built in 1860, was a converted brick cotton warehouse on Arch Street, above the banks of the Alabama River. This structure covered approximately 15,000 square feet and was surrounded by a larger wooden stockade when converted into a prison. The warehouse building had one fireplace and 432 bunk spaces and was built to house approximately 500 prisoners, but its population had grown to 660 by August 1864. When Union General Ulysses S. Grant suspended the practice of prisoner exchange with the Confederacy the numbers began to soar. By October 1864 the prison’s numbers had swelled to 2,151, and had grown to more than 3,000 by March 1865. R. H. Whitfield, the prison surgeon, reported unhygienic conditions at the camp, citing the lack of a sanitary water supply. The death rate, however, was considered extremely low compared to other Confederate and Union Civil War prison camps. Federal and Confederate records indicate that between 142 and 147 men died at Cahaba Prison. Alabama's economy plunged into crisis during the war. Confederate general Braxton Bragg returned home to find "all was lost, except my debts." With fields destroyed and slaves gone, the state's farms recaptured less than 40% of their pre-war value. Alabama built railroads and restarted cotton production, but the state's coal and iron industries would not develop until the 1880s. According to the Presidential plan of reorganization, a provisional governor for Alabama was appointed in June 1865. A state convention met in September of the same year, and declared the ordinance of secession null and void and slavery abolished. A legislature and a governor were elected in November, and the legislature was at once recognized by President Andrew Johnson, but not by Congress, which refused to seat the delegation. Johnson ordered the Army to allow the inauguration of the governor after the legislature ratified the Thirteenth Amendment in December, 1865. But the legislature's passage of Black Codes to control the freedmen who were flocking from the plantations to the towns, and its rejection of the Fourteenth Amendment, intensified Congressional hostility to the Presidential plan. Following the war, the state was still chiefly agricultural, with an economy tied to cotton. During Reconstruction, state legislators ratified a new state constitution in 1868 that created a public school system for the first time and expanded women's rights. Legislators funded numerous public road and railroad projects, although these were plagued with allegations of fraud and misappropriation. During this time, organized resistance groups acted to suppress freedmen and Republicans. Although the Ku Klux Klan is the most well known, also among these groups were the Pale Faces, Knights of the White Camellia, Red Shirts, and White League. Reconstruction in Alabama ended in 1874, when Democrats took control of the legislature and governor's office. They wrote a new constitution in 1875. Also in 1875, the legislature passed the Blaine Amendment, to prohibit public money from being used to finance religious affiliated schools. In that same year, legislation was approved that called for racially segregated schools. Railroad passenger cars were segregated in 1891. Additional Jim Crow laws were passed after the turn of the 19th to 20th century. Should the Alabama state capitol be allowed to fly the Confederate flag? Sources: National Park Service; National Archives; Library of Congress; Official Records of the Union and Confederate Armies; US Census Bureau; Fleming, Walter Lynwood. Civil War and Reconstruction in Alabama (1905); Storey, Margaret M., Loyalty and Loss: Alabama's Unionists in the Civil War and Reconstruction. Baton Rouge: Louisiana State University Press, 2004; Baldwin, Joseph Glover; Louis M. Hacker (1957). The Flush Times of Alabama and Mississippi: A Series of Sketches (1853). New York: Sagamore Press; Beidler (ed. ), Philip D. (1987). The Art of Fiction in the Heart of Dixie: An Anthology of Alabama Writers. Tuscaloosa: The University of Alabama Press. ISBN 978-0-8173-0313-6; Griffith (ed. ), Lucille Blanche (1972). Alabama: A Documentary History to 1900. Tuscaloosa: The University of Alabama Press. ISBN 978-0-8173-0371-6; McMillan, Malcolm Cook (1992). The Alabama Confederate Reader (1963). Tuscaloosa: The University of Alabama Press. ISBN 978-0-8173-0595-6; Alabama Department of Archives and History.